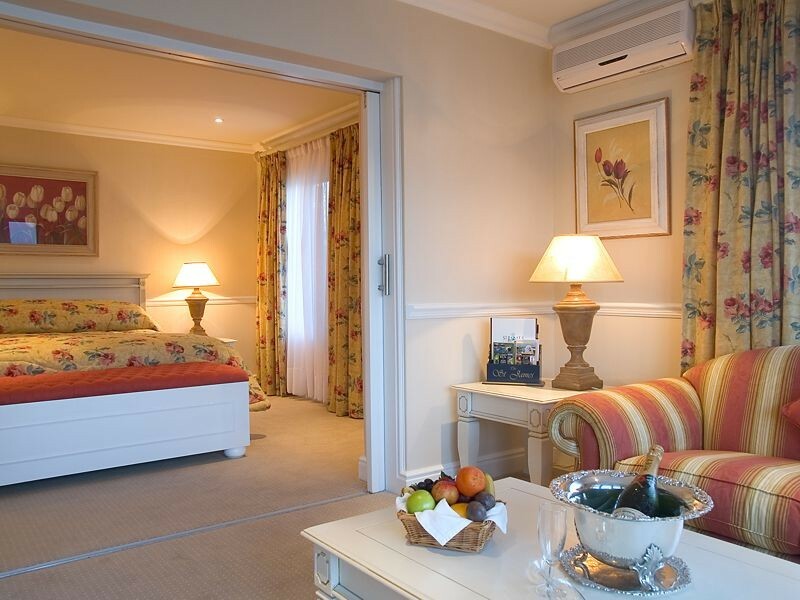 St James Of Knysna is located in the heart of the Garden Route, nestled on the shores of the famous Knysna Lagoon, with dramatic views, lies this exclusive 5 Star Country House Hotel. Set in magnificent gardens, this privately owned Country House Hotel has two swimming pools. Other recreational facilities include boating picnics, sun-downer cruises, water skiing, swimming, games room, angling, shopping and tavern tours. Enjoy a sun-downer cruise, water-skiing or sightseeing on the Knysna Lagoon from our private jetty. The Hotel boasts a superb dining room and well stocked wine cellar. Country style breakfasts, light lunches, teas and snacks are also served on the various patios and terraces. The Paquita Bar, with its lagoon facing patio is a warm and friendly meeting place. As guests at this unique Hotel you can expect exclusivity and individual attention to all your needs. The spectacular and panoramic views of Knysna and the Lagoon can be experienced whilst exquisite cuisine is served in the candlelit dining room. Guest can then relax and unwind in front of a crackling log fire in the main lounge whilst savoring a fine port from our well-stocked cellar. Join us in the cocktail bar where travel experiences of exciting daily events can be shared with others over a pre-drink or a cocktail. Awsome place and wonderful value. Great staff. Lovely old English style venue with beautiful views and gardens. Lovely food, well recommended! Wonderful accomodation. The rooms are the size of an apartment. Well located. "The special treatment we received as newly weds"
Beautiful setting over the lagoon. Great position & comfortable with friendly staff. Beautifully appointed suites in a glorious setting! Such an enthusiastic welcome and lovely public rooms! Chef definitely weaves magic in the kitchen!! Great spot to stay along the garden route. Staff are so friendly and helpful with local locations to see while you stay. Food was great with a good selection. Fantastic accommodation, very helpful when our air conditioning packed up, actually changed our room. Food excellent. Even washed my car for me. Request a quote from St James Of Knysna at no obligation.